Imagine you are in a time capsule. You open the door and peer out to see the Bengaluru city, especially the Gavipuram-Gandhibazaar area at different periods in time. Circa 1540: Work going on at Kempambudhi. Kempegowdaru is building a huge lake for the settlement here which later comes to be called Kempambudhi lake. He visits the Gavi (cave) Gangadeshwara temple and prays to the lord. 1900s: Basavanagudi is a spacious settlement for the pete people with huge roads and wide open spaces. A little beyond are the some villages in Gavipuram. There are a few who venture into this area. It’s a good view from the Kempegowda watch tower, but civilization ends with Bull Temple road. Circa 2010: Gavipuram is a part of Hanumanthanagar Ward. The area is in the heart of Gandhibazaar-Basavanagudi-Hanumanthanagar area. The old buildings are gone and apartments have risen. The newer occupants hardly know about Gavipuram. For Bangaloreans, this area is famous for Vidyarthi Bhavan Dosa or National College; it ends there. Only some who have grown up here talk about the ‘cave temple’. Do you feel sad? Here is some news that would cheer heritage enthusiasts. Gavipuram just got a thrust from politicians and city-based organisations to be showcased as a model heritage zone of the city. On the World Heritage Day, April 18, the Indian National Trust For Art and Cultural Heritage (INTACH) held a panel discussion at the Udayabhanu Kala Sangha Auditorium. The discussion aimed to achieve a plan to make the historic Gavipuram a heritage zone. The event was jointly organised by INTACH and Udayabhanu Kala Sangha, a volunteer-based literary, cultural and social organisation. The event was open for all who had ideas in preserving the area’s heritage and its improvement. Residents of Gavipuram, Hanumanthnagar and Basavanagudi participated in the event. It also received full political support from the corporators of Hanumanthnagar and Sunkenahalli, Chandrashekar (Congress) and Sadashiva (BJP), along with the MLA of Basavanagudi, Ravi Subramanya. The function was compered by M Narasimha, Founder-Secretary of the Udayabhanu Kala Sangha, and Sathyaprakash Varanashi, Convenor, INTACH Bangalore Chapter. It started with a brief introduction about the area by Narasimha. The baton was then handed over to the elected representatives. Ravi Subramanya spoke at length about all the heritage spots of the area. He explained the many measures taken to revive the places; diversion of sewage from the Kempambudhi lake, budget sanction for lake restoration, aiding cultural fairs such as Kadlekai Parishe to name a few. He also released a booklet about the area on the occasion. Corporators Sadashiva and Chandrashekar were both in full support for the event’s intent. While Chandrashekar outlined steps to check heritage zone encroachment, Sadashiva said that he would take efforts to create a cell that is authorised to preserve monuments and heritage spots. After the political honchos had made their statements, INTACH’s Pankaj Modi gave a spatial presentation of Gavipuram’s heritage spots and shared ideas on promoting the zone. He proposed heritage walks, setting up maps in the area, good pedestrian walkways, holding a Gavipura Divasa or Mela and conducting a cultural programme on that day in temple vicinity. However the most important was having specific bye laws that protect not just the spots but the area around it. Dr Aswath Narayan, Convenor, Karnataka INTACH, said that while he was happy that a conscious attempt is made towards heritage, political honchos must push for heritage regulations to be set. Emphasising the importance of legal and finance support for heritage preservation, he gave the example of UK National trust that provides financial aid to the owners of 400-500 years old buildings in that country. The second half of the event was the panel discussion. Meera K, Co-founder and editor, Citizen Matters, emphasised the importance of documentation and how to reach out to people, especially children. Citizen Matters, as a Bangalore-focused local news magazine and has covered city heritage extensively. Dr Aruni, Director, Indian Council of Historical Research (ICHR), Bangalore, made two important points; a museum that depicts the evolution of the city’s history through its maps and secondly, collating the city’s literature. 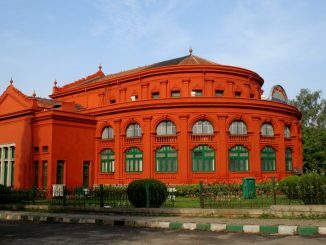 The chief minister’s committee for Bangalore – Agenda for Bangalore Infrastructure and Development or ABIDe – was represented by Sanjay Sridhar. He explained the perception of ‘heritage’ and announced that ABIDe was going to identify a heritage monument in the city and convert it as a museum that holds rare artefacts from the city’s history. While many such ideas were put forth, it seemed that there was too short a time for the panellists to discuss. Also, panellists were more comfortable in stating their ideas rather than a discussion between themselves. The audience had some queries too. Rao, a Gavipuram resident, was sceptical. He admitted there was clarity at a higher level, and inquired about the plans and their implementation at a micro level. Vineetha, a heritage enthusiast, highlighted that INTACH should take steps or measures in reaching to people of different socio economic forum. Audience suggestions were taken in good spirit, but most of the panel members and organisers did not respond in much detail. It was disheartening to see the audience dwindle after the corporators made their exit mid-way. It almost seemed that the area’s residents felt that meetings end when politicians leave. On the question of lack of interest amongst better-off citizens, Supreeth, an engineer now residing at Srinagar said it’s certainly not a lack of interest but that people just do not have the time. He suggested other ways to generate people’s interest. Instead of just paper advertisements, he suggested posters near parks or places where people meet. Another suggestion was to create the awareness by talking to people who usually walk upto Narahari gudda in the early mornings. Also a heritage and a cyclist enthusiast, Supreeth suggested a ‘Pedal into history‘ programme to his cyclist group, Critical Mass. The route started from Cubbon park and the group rode to Gavi Gangadeshwara temple at Gavipuram. As a kid, Supreeth says his house was just 600 metres from the watch tower and recalls with pride the history of his area. One of the persons who did know about the meeting (and therefore could not attend) was Palahalli Vishwanath, a scientist who in December 2008 wrote an excellent and well received article on Basavanagudi in Citizen Matters. Vishwanath says that steps being proposed to preserve and promote heritage are very necessary. He feels that since the average age in the area is older than other newer areas like Koramangala, the residents are conservative Mysorean kind who would rather ‘adjust’ to the present times. He recalls that Gavipuram for him stood for Masti Venkatesha Iyengar, the famous Scholar and Y N Krishnamuthy, the yesteryear journalist; both of them had houses in that area. All in all, the organisers and the participants worked with good intent. But come to implementation, as Aswath Narayan of INTACH mentioned, legislation and money for preservation are needed. I understand your point on the non-sequitur. Thanks for the clarification.